AfriClassical: Eric Conway, D.M.A. 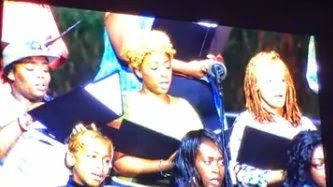 : Morgan State University Choir to sing in Star Spangled event tonight at 8PM on PBS! Eric Conway, D.M.A. : Morgan State University Choir to sing in Star Spangled event tonight at 8PM on PBS! Most of you already are aware of the huge national spotlight that Baltimore will enjoy this weekend as we celebrate the 200th anniversary of our National Anthem. The Morgan State University Choir will be an important participant in this weekend's activities! This evening's event will feature two simultaneous events. PBS television will bounce back between concerts at Pier 6 and Fort McHenry. A concert at Pier 6 with several huge names participating including host of the the event John Lithgow and artists Kristin Chenoweth, Melissa Etheridge, Denyce Graves, Smokey Robinson, and Kenny Rogers. American idol phonon Jordin Sparks will also co-host at Pier six but during the middle of the event will be driven by speedboat to Fort McHenry to continue as host at Fort McHenry where the second event is taking place at the same time. At Fort McHenry, the Morgan State University Choir will join with Jordin Sparks in singing the culminating activity of the evening, the singing of a the Star Spangled Banner. Prior to our performance at Fort McHenry, several dignitaries will speak including Governor O'Malley, Senators Ben Cardin, Barbara Miluski, and ending with Vice-President Biden. Throughout these short remarks from our politicians will be music featuring the Morgan State University choir and the President's own United States Marine Band. I invite everyone to either attend the event this evening at Fort McHenry which is free and open to the public or tune in to your local PBS station or website which should be streamed live to behold this historic event. The event will begin at 8PM on PBS station and go until 10 PM. At the end of our performance of the Star Spangled Banner, a Fireworks display is timed to begin and continue for approximately 20 minutes - threatening to be the greatest fireworks display in Baltimore Harbor History! Please see a YouTube link from our rehearsal below to entice you. I hope that you can view.